Medicom has released a few new Disney themed Kubrick 2-packs. 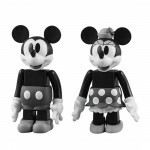 The 2-packs include Mickey Mouse and Minnie Mouse (black and white), Goofy and Donald Duck (black and white) and Runaway Brain Mickey Mouse and Julius. They were released today at a price of 2,604 Yen (about $28 USD). Click the headline of the story for photos of the figures. MINDstyle has revealed the first image of their upcoming Maximilian figure. 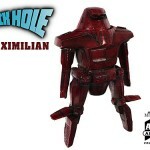 The figure, based on Maximilian from Disney‘s cult classic film The Black Hole, is part of the Art Toy Collectibles line. Click the thumbnail for the image. All times are GMT -4. The time now is 7:22 PM.